Happy Friday! I love Fridays. Luke drives me into work on Fridays which is such a treat for me. Lately I’ve been struggling to keep my eyes open on my drive in (the time change didn’t help since it’s now dark for almost the entire drive) but on Friday’s Luke drives so I get to sleep! I even brought a pillow and a blanket this morning and had the heated seat on! It was delightful! While I worked Luke spent the day running errands, studying (at the beach! ), hanging out at a sports bar…etc and met me for lunch at PF Changs 🙂 It was a great day and I am thrilled for the weekend. I had nothing planned for dinner except for no meat (on Fridays) so I looked in the fridge and we had parmesan. I decided to make mac and cheese. Then I totally surprised myself by adding broccoli to it! For anyone that knows me…I would not have touched broccoli with a ten foot poll a year ago (or any veggie for that matter) but marriage has broadened my horizons! It was delish 🙂 The recipe is adapted from our fav book The Silver Spoon. Bon Appetit! Preheat the oven to 475 degrees. Make one quantity of béchamel sauce (recipe below). Meanwhile, cook the macaroni in a large pot of salted, boiling water until just al dente, then drain and pour into a bowl. Add the broccoli to a pan with about an inch of water, bring to a boil and then turn to medium low, cover and simmer for about 5 minutes. Next add the Parmesan, butter, and egg yolks to the béchamel sauce, stir to combine and melt together. 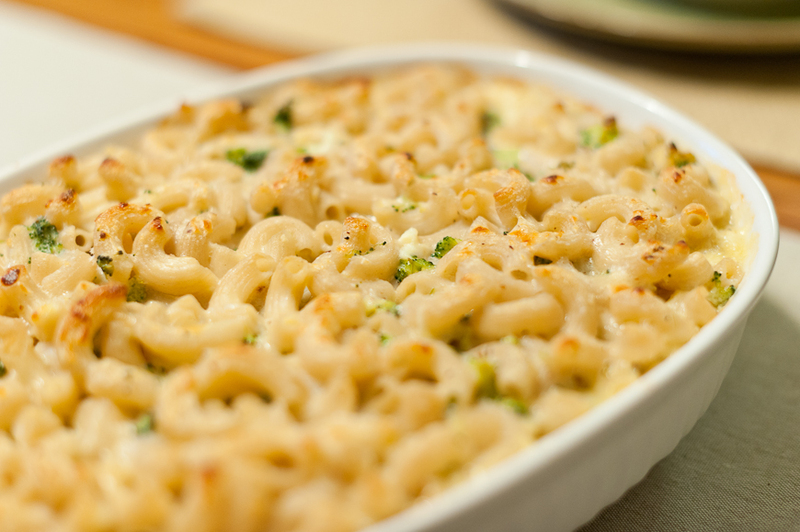 Gently stir in half of the béchamel sauce mixture with the macaroni noodles. Stir in the broccoli. 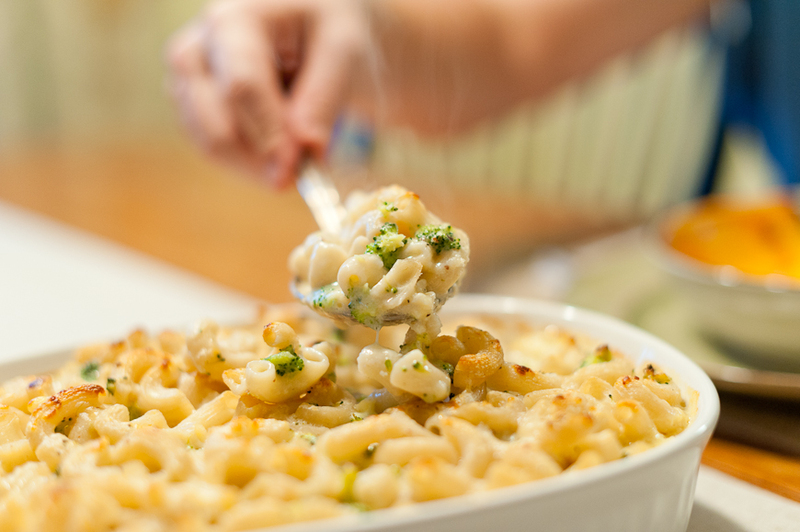 Pour the pasta into the prepared dish, then spoon the remaining béchamel sauce mixture on top. Bake for 15–20 minutes, until golden brown. Melt the butter in a pan over medium heat. Remove the pan from the heat and whisk in the flour to make a smooth paste. Using a wooden spoon, gradually stir in all the milk, making sure the sauce is smooth between each addition. Return the pan to the heat and cook over medium-high heat, stirring continuously until it starts to boil. Season with salt, lower the heat, cover, and simmer gently over low heat, stirring occasionally, for about 20 minutes. The sauce should be thick enough to coat the back of the spoon and not run off. Taste, add more salt if necessary, and season with pepper.